Bronze is a metal that is a mixture of a little tin and a lot of copper. It was invented in West Asia, where copper was smelted as early as 6000 BC, and during the 3000s BC experiments showed that adding tin to the copper made it harder: that is bronze. Bronze came to Greece slowly around 3000 BC and did not make much difference right away. 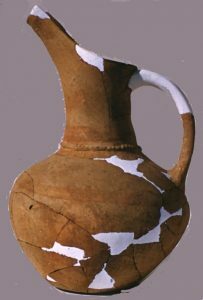 Those same Dimini people from the Neolithic continued living in Greece, but they slowly started to use a little bronze. Bronze knives and swords were much easier to make and sharper than stone, bone or wood ones. At the same time, people in Greece started to use lead, silver, and gold as well. But bronze was very expensive, too. Copper wasn’t so hard to get, but traders had to bring tin on donkeys from far away in central Europe (modern Austria). So only the richer or stronger people could afford bronze tools or weapons. Soon a real class system started to develop, where the richer people nearly always married each other and not the poorer people, and it was always these richer people who were in charge. One way archaeologists can tell that there is a class of rich people whose children inherit their wealth is by finding graves with children buried in them who have gold jewelry and bronze tools and weapons and many beads with them. Can you see why this shows us that there was a rich class? Lerna is an example of an Early Bronze Age village that has been excavated. Like Dimini, Lerna had a big house in the center, at the top of the hill, which may have been the house of the chief. We call this house the House of the Tiles, because it had clay tiles for the roof. Lerna also had many baskets which had been sealed with a special mark pressed into a lump of clay. This shows that people cared about protecting their property so it would not be stolen. Lerna also had big stone walls, built with defensive tricks to make it hard for invaders to break in. But around 2100 BC, just as the people of Lerna were in the middle of rebuilding these walls to make them even stronger, some new people invaded Greece and burned down the whole town. Many other towns all over Greece and much of Europe were also destroyed around this time. The Archaeology of Greece: An Introduction, by William R. Biers (1996). Biers writes very clearly and has a lot of good pictures. Greek Art and Archaeology (3rd Edition), by John G. Pedley (2002) This has a lot of good information and is pretty readable. Plus, Pedley is really an expert in this field. The Coming of the Greeks, by Robert Drews (reprinted 1994). About the arrival of the Indo-Europeans in Greece, about 2000 BC. Cite this page: Carr, K.E. Greece in the Early Bronze Age. Quatr.us Study Guides, July 7, 2017. Web. April 21, 2019.